You may remember that last year, I popped round to my friend Jodie of A Handmade Cottage, to learn how to make a cushion cover. Jodie’s blog is packed to the hilt of all kinds of crafty projects and ideas, and I asked her if she’d like to donate one to my little corner of the universe today… and ta da! She did. At last spring is finally on her way – the bluebells are poking their little noses out from their mossy cocoons, the daffodils are blooming and the Easter holiday is just around the corner. So to celebrate the coming of all things bright and beautiful I decided to make some easy peasy bunting to decorate the house and garden with. This bunting is by far the easiest bunting you can make, you don’t need advanced sewing skills and in true Jodie Podie stylie it will take just one hour to put this cheerful ensemble together. I use this template again and again as it can be adapted to suit any occasion or season, be it Easter, summer garden parties and BBQs, birthdays, weddings or Christmas! 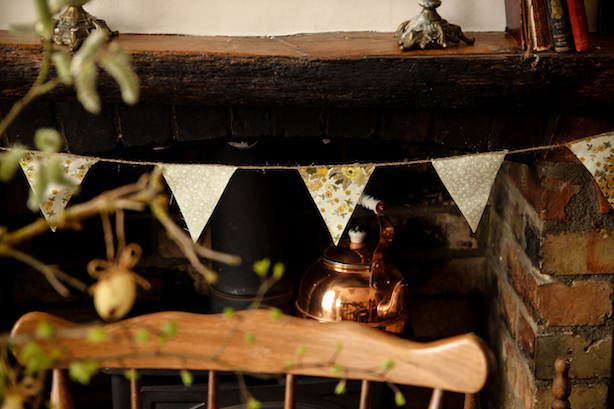 Simply choose your fabric, whip up your bunting and you’ll have some lovely decorations to use year after year. Step 1: Draw a triangle the size of the bunting you want to make, onto a piece of cardboard. Cut it out to form a template. Then use this template to draw 6 triangles on your fabric. Cut them out. Step 2: Lay the fabric pieces front-side up on a table at regular intervals. Then lay you’re string along the top so you can see how much you need. 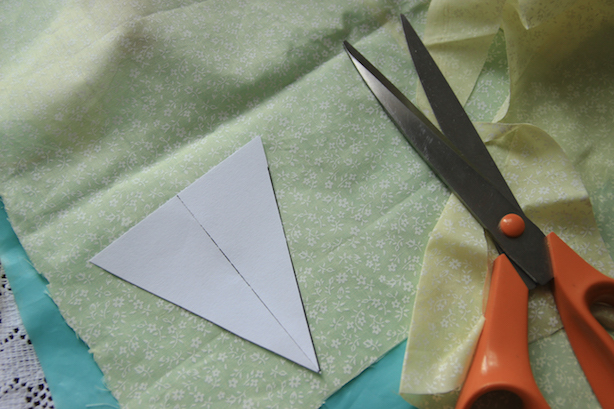 Then using your glue gun or fabric glue simple apply a thin line of glue along the top edge of the bunting – and lay the long piece of brown string along the top one triangle at a time. Remember to leave enough access string at either end for tying. 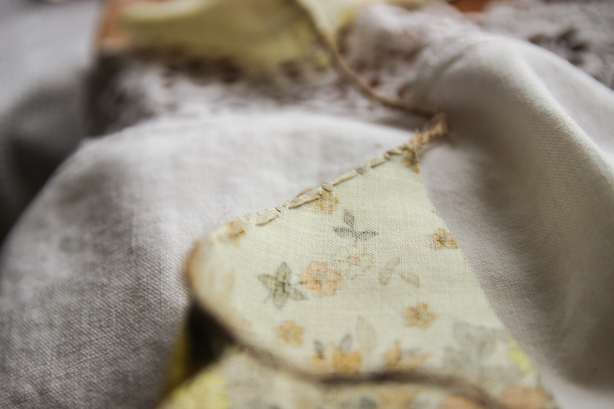 Step 3: If you want to sew the bunting, lay the fabric pieces front-side up on a table at regular intervals. 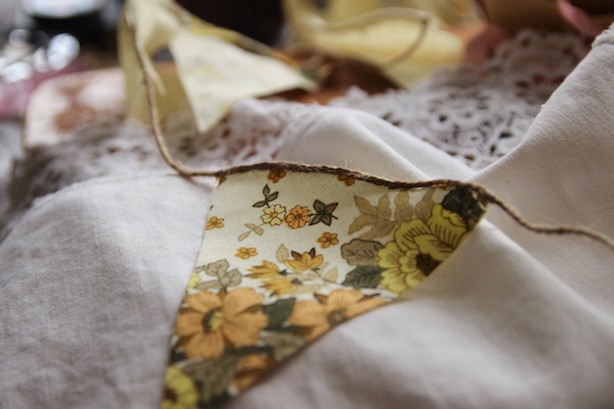 Then lay your long piece of brown string along the top edge of the bunting – and pin in place. Thread your needle with a long piece of matching brown cotton and tie a decent knot in the ends, then starting one end simple sew each piece of fabric to the string using a simple in-and-out running stitch. To make sure it was secure I made an extra vertical stitch in between. Remember to leave enough access string at either end for tying. Happy bunting making everyone, I can’t wait to see everyone’s creations. Thank you to A Handmade Cottage for guest posting on my blog today – you are welcome anytime! Now I have just a couple of hours before I’m jumping on a plane to Marbella for a few days… It’s a short little press trip, but I’m keeping my fingers crossed for sunshine and pretty sunsets… If you’d like to follow along my adventures, you’ll find me on snapchat as poppyloves. Or you can find me on Twitter here. I’ve packed my book, my passport, my bikini and some pants. That’s all I need, yes?